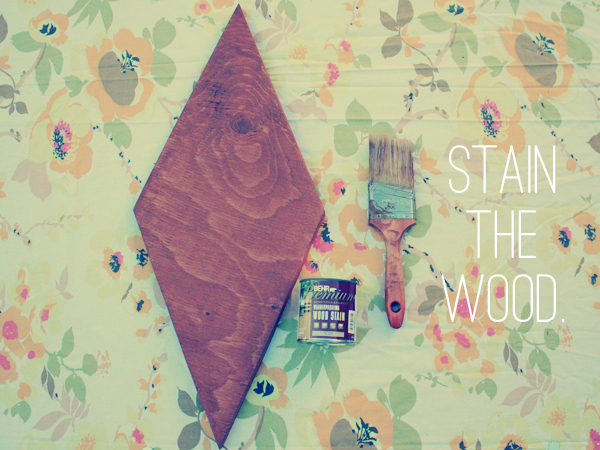 Oh So Lovely Vintage: DIY Retro Wood Wall Art! 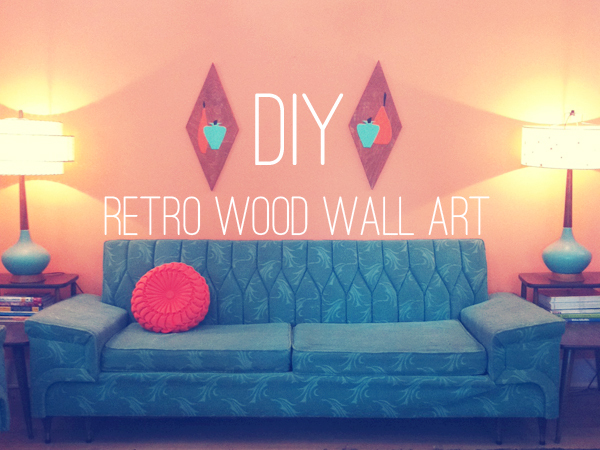 DIY Retro Wood Wall Art! 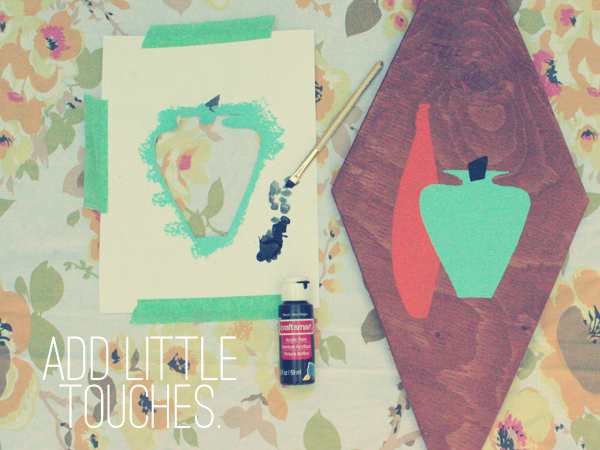 Today we are going to share a fun little home decor project with you! It is quite simple but a little bit time consuming so it is the perfect project for a crafty summer evening! First step - Stain the wood. I chose a medium brown stain with a bit of a reddish tint to it because it sort of reminded me of an old sixties teak table. When working with stain remember that it dries quickly so always finish the whole piece all at once rather than starting and finishing later. Second step - Cut out your stencil and tape it down. 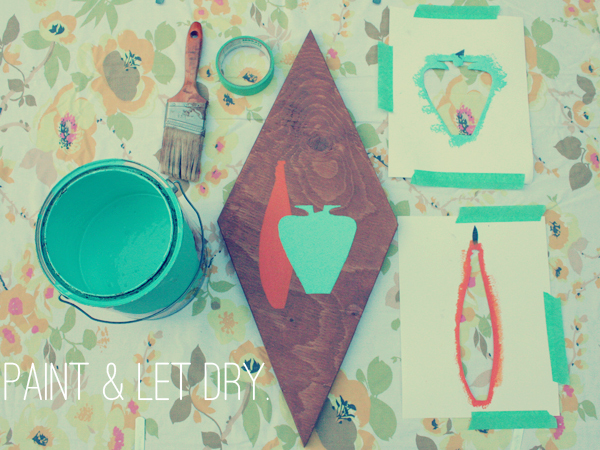 While your stain is drying cut out your stencils. 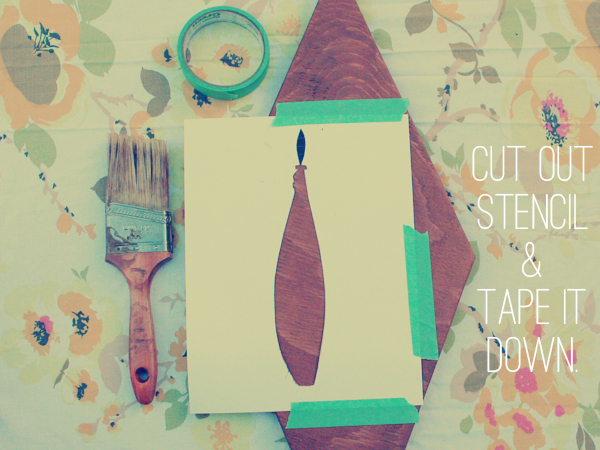 Once the stain is dry to the touch you can tape your stencils down in your desired locations. Make sure it is securely taped down because you don't want them to move around when you start brushing paint on. I used two different stencils overlapped to create this look. First I taped the tall skinny stencil down and painted over it with two coats of orange paint. I let it totally dry before taping the second stencil on because I knew that I wanted them to overlap a bit, and then I gave the second stencil two coats of turquoise paint and let them both dry. It is important to be patient and let the first stencil dry completely before applying the second stencil because you don't want to risk smudging any paint. Fourth step - Add little touches. Instead of cutting out such a small stencil for the stem of the apple I decided to just paint the intricate details by hand using a small brush. Painting by hand can be tricky, so just be sure to go slow and take your time. Once you are satisfied with how the paint looks and it has dried, it is time to spray it with a clear coat. This is an optional step, but applying a clear coat not only protects your art piece but it all gives the wood a nice shiny appearance. I am planning on hanging mine outside my house on the wall of my patio so I especially want to make sure that I give the wood a good thorough coating because I want to keep it protected from rain and humidity. 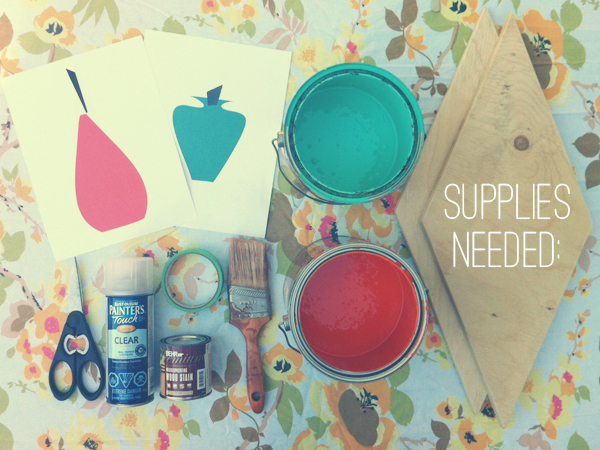 You don't need to worry about this as much if you are planning on keeping your art indoors. Fifth step - Hang it. 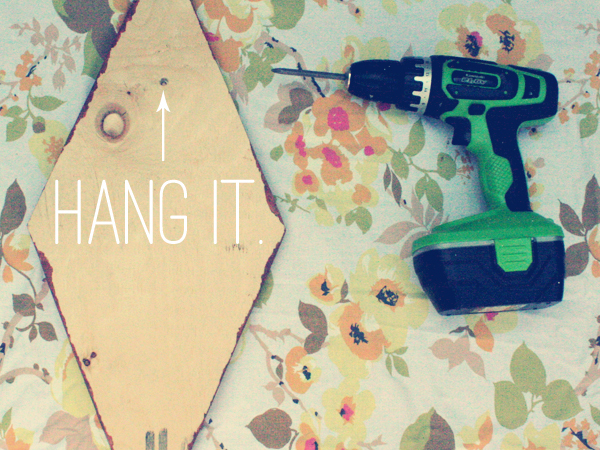 There are different options you can use to mount your piece: you could use a picturing hanging kit or you could get a little hook from your hardware store. I decided to take an even easier approach and I just drilled a half inch deep hole in the back. That way if I hammer a nail into the wall it will fit nicely in the shallow hole at the back of the wood. If you decided to use this method then be sure to drill slowly because you don't want to all of a sudden drill too far and have your drill come out the other side! And you're done! Have fun finding the perfect spot for your new custom art work! 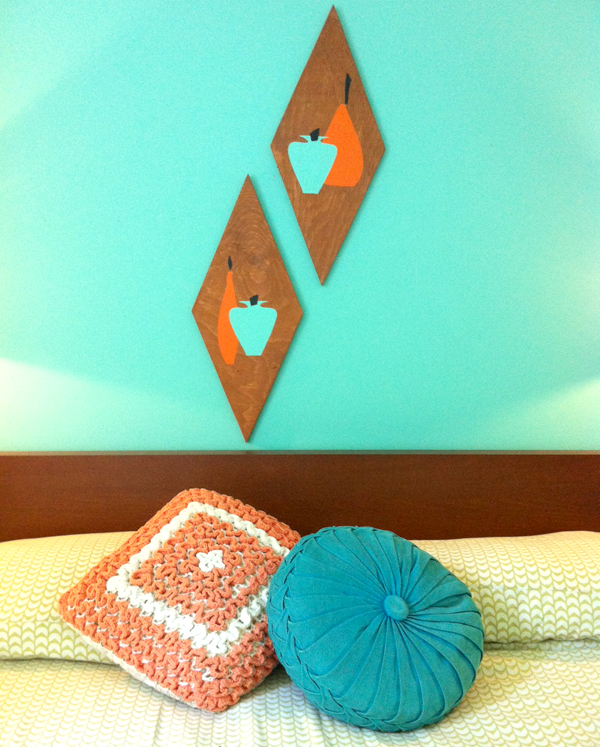 I love centering mine above my bed or above the turquoise couch in my living room! So cool! I love how creative yet simple it is and the opportunities are endless with so many stencils out there! I really like the fact that you made your own stencil, it adds a nice personal touch. Very cute. I love your stencils and the colors you used. adorable idea i have to try this! Oh, how totally clever of you, so mid century, step over Robert Lyon, make room fkr 'Oh so vintage'. I particularly like the colours you chose. Awesome! very adorable! As I was looking at the post it occurred to me you may be able to add texture to it ( the rocky textures like the ones you were describing in the wood art post) by using those aquarium rocks you know you buy them at the pet store for fish aquariums. they come in a multitude of colours! you could probably just use jewel/craft glue and sprinkle them on and leave flat until dry, but even as is, so adorable though, great idea! Thanks girl! Yeah we originally were going to do that, but it just didn't work out too swell. It would be super cute though! Very retro. I love the design! What color did you use on your walls, I can't find the right turquoise. Wow, great tutorial, the picture you have added here looking so good, useful post for making wood art, keep it up. Very nice wood wall art work. I like it!